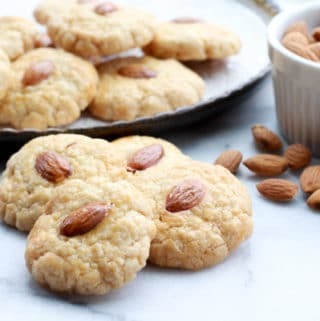 Last Updated: April 12, 2019 · Published: April 30, 2018 By: Asian Caucasian 6 Comments This post may contain affiliate links or sponsored content. 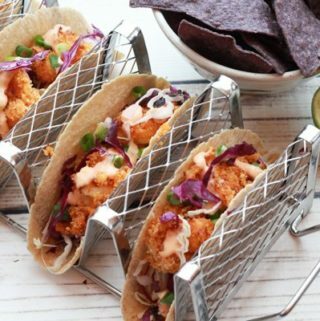 We’re all about using sustainably-caught seafood in our recipes! 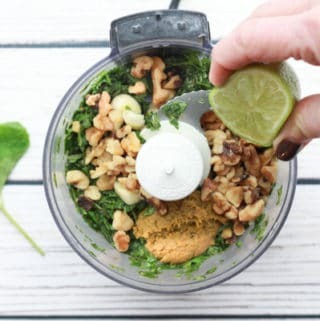 So, we’ve partnered with Sea to Table for this sponsored post. 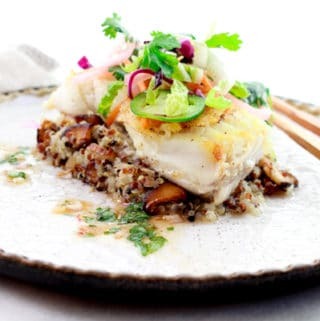 They offer a great selection of wild, domestic, and sustainable seafood delivered right to your door — like this super tasty Gulf of Maine Redfish. 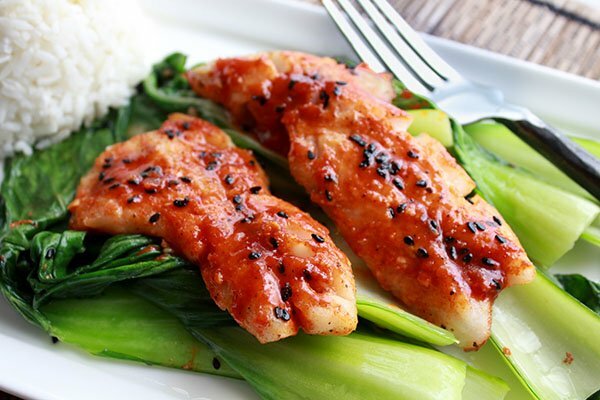 Our Seared Gochujang-Glazed Redfish recipe takes this mild fish to the next level! Incredibly fresh, this redfish sears beautifully and goes well nestled with some leafy greens, like Baby Bok Choy with Ginger and Garlic. 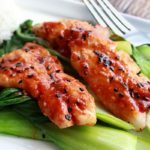 The sauce is Korean-inspired with a touch of heat from the Gochujang, balanced with hints of ginger, soy, lime juice, and mirin. The redfish cooks very quickly so dinner is on the table in no time! You’re going to love this one — it’s two fins up! This post is sponsored by Sea to Table. 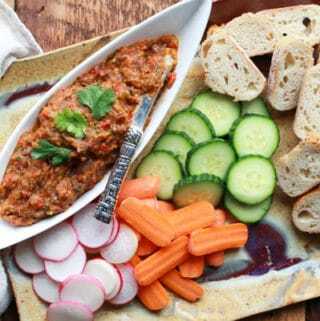 Gorgeous, deep water Gulf of Maine Redfish makes a delightful, healthy dish perfect for entertaining! The redfish cooks up quickly and beautifully. Gulf of Maine Redfish is available for delivery right to your door by purchasing online at Sea to Table. 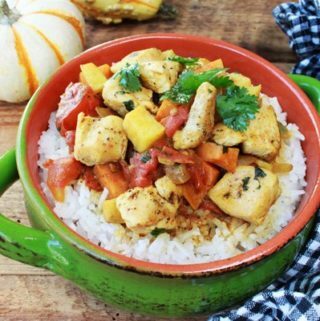 Gulf of Maine Redfish makes a great alternative to other white-meat fish like snapper, and is perfect for a long list of recipes. True to their name, redfish have bright red skin that crisps up beautifully under the broiler! Our special sauce brightens up this redfish with hints of sweet and spicy from the Gochujang sauce, lime juice, soy sauce, mirin, ginger, garlic, and a dash of sugar. 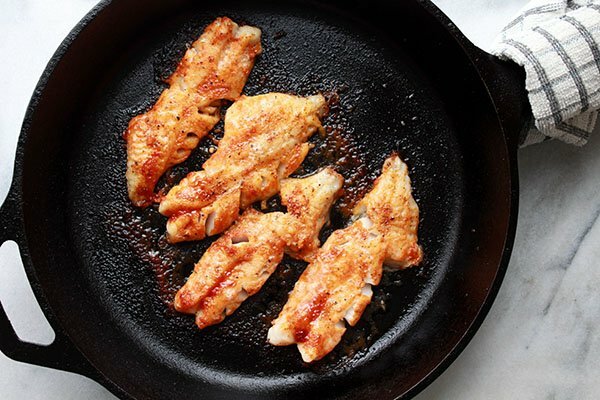 We pan seared the redfish quickly in a heavy cast iron, then brushed it with our Gochujang sauce and placed it under the broiler for a few minutes. Perfection! The redfish goes well nestled with some leafy greens, like baby bok choy. 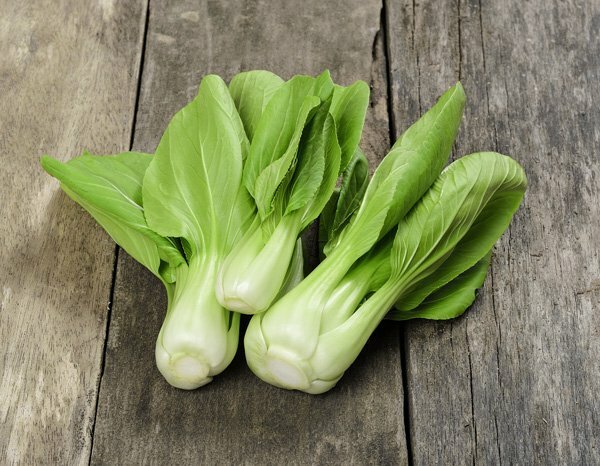 Try it with our Baby Bok Choy with Ginger and Garlic! 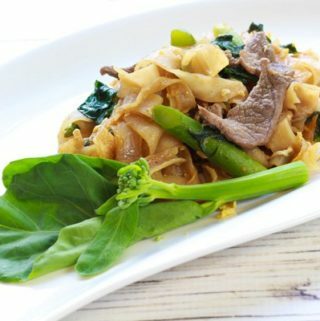 Such a beautiful dish that goes well with greens and steamed rice. We are loving this Gulf of Maine Redfish! 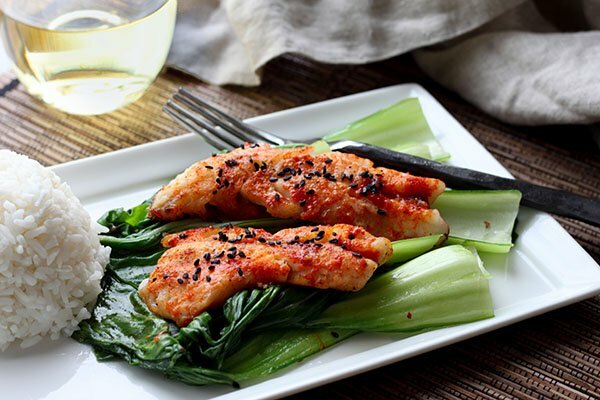 Our Seared Gochujang-Glazed Redfish recipe takes this mild fish to the next level! The sauce is Korean-inspired with a touch of heat from the Gochujang, balanced with hints of ginger, soy, lime juice, and mirin. 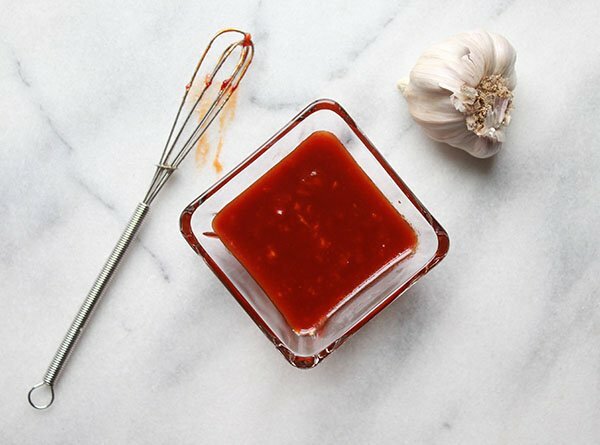 To make the glaze: In a small mixing bowl combine the Gochujang sauce, mirin, soy sauce, sugar, lime juice, sesame oil, garlic, and ginger. Whisk together until thoroughly combined. Place the oven on broil. 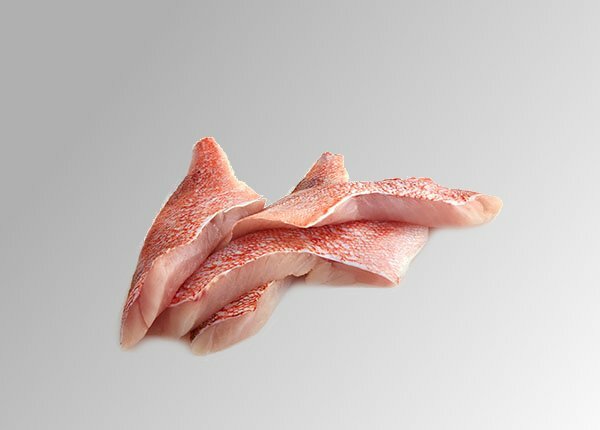 Score the redfish filets skin-side to prevent from curling. Heat a heavy cast iron pan on medium-high with canola oil. Brush the redfish with the glaze, reserving a quarter of the glaze for basting. Sear the redfish skin side down for 3 minutes. Place the fish directly in the oven. Broil the fish in the oven for approximately 2 to 3 minutes (test with a fork for doneness). 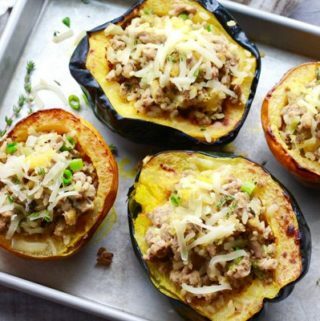 Remove from the oven and brush with more of the glaze if desired. Garnish with black sesame seeds and lime wedges. Serve on a bed of baby bok choy and steamed rice if desired. You can purchase Gulf of Maine Redfish online at Sea to Table. Gulf of Maine Redfish is a deepwater groundfish harvested off the coast of New England. Sea to Table works closely with the Gulf of Maine Research Institute to ensure that their redfish fishermen meet the strict responsible harvest criteria. Once a highly sought after fish, redfish is used mainly as lobster bait today. 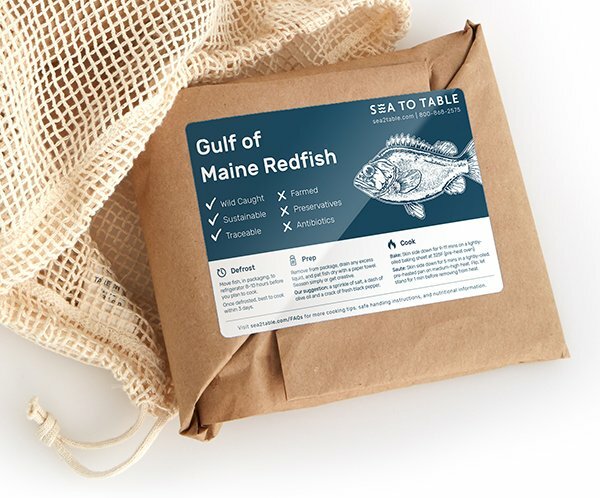 Redfish made a triumphant return from being overfished in the Atlantic Ocean, and now thrive in the deep waters off the coasts of Maine, Massachusetts, and New Hampshire. Restaurants and home cooks all over New England embrace Gulf of Maine Redfish for its mild, slightly sweet taste and flaky meat. 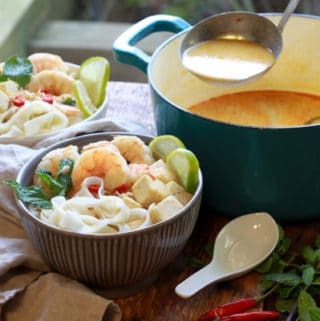 This fish makes a great alternative to other white-meat fish like Snapper, and is perfect for a long list of recipes. True to their name, redfish have bright red skin that crisps up beautifully under the broiler! 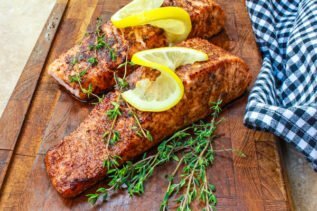 If you liked this recipe, try our Asian Rubbed Salmon. Love that bed of greens you’ve got going on there! Sauteed Baby Bok Choy could not be easier! They work well as the base for any fish! Thank you! This redfish looks absolutely delicious! Thanks for sharing!! Thank you, Jocelyn! This is such a beautiful fish, a lot like a red snapper. It cooks up so quickly too! I’m going to try redfish next time seafood is on our menu! Such a beautiful fish, and cooks up incredibly fast! You’ll love this one!